Stephen Michael in his heyday. WHEN talking about the greatest players to have pulled on the red and white jumper of the South Fremantle Football Club, few can go past Stephen Michael. 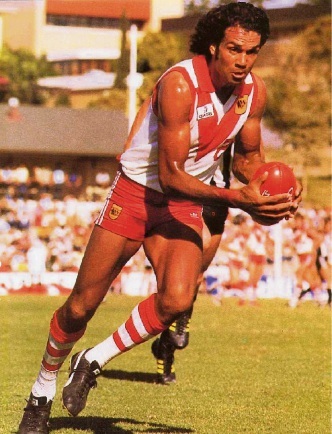 The 243-gamer, who ran riot on the field for 10 years between 1975 and 1985, won two Sandover Medals, five South Fremantle fairest and best awards, a premiership and induction into both the West Australian and Australia football halls of fame. Now he will be in the minds of the next generation of players coming through the ranks after the club launched the Stephen Michael Foundation. South Fremantle chief executive Tom Bottrell said the foundation’s aim would be to open up opportunities for the youth in the club’s zone, regardless of their colour, ethnic background or social circumstances. “Stephen Michael is regarded by many as the best player in the club’s history and the fact that he is equally as good a person gives fantastic credibility to the Foundation and we are thankful Stephen has agreed to be involved,” he said. “The foundation is officially launched this month, with a key partnership formed with Fremantle College, which opens its doors in 2018 and will specialise in Australian Rules Football.